Every week, I scour the web to find inspiring outfits on your favorite celebs and help you recreate their looks! This week, I was inspired by Rihanna, Kaia Gerber, and Yara Shahidi. Read on to see how you can get their looks for yourself. Rihanna looked sleek and stylish while out in NYC. While she’s known for wearing eclectic ensembles, this past week Rihanna opted for something a bit more simple: a ribbed black turtleneck, black skinny jeans, and black pointy toe booties. She layered a brown suede jacket over top, and accessorized with eye-catching pieces like chunky gold hoop earrings, oversized shield sunglasses, and a printed Dior bag worn crossbody style. A black turtleneck or mock neck top is a wardrobe staple that is ultra versatile and never goes out of style. To style it like Rihanna, go for a monochrome look by pairing it with black skinny jeans and black pointy toe booties. This brown faux suede trucker jacket is the perfect dupe for her jacket. RiRi’s outfit is all about the accessories, so give the ensemble flair by wearing chunky gold hoop earrings, oversized shield sunglasses, and a printed belt bag worn across your body. Kaia Gerber styled her black turtleneck top in a classic-meets-cool way. While in Milan, Kaia paired her top with some high-rise bootcut jeans, white lace-up boots, and a menswear-inspired long beige plaid coat. She accessorized with some metal oval sunglasses and a black shoulder bag. 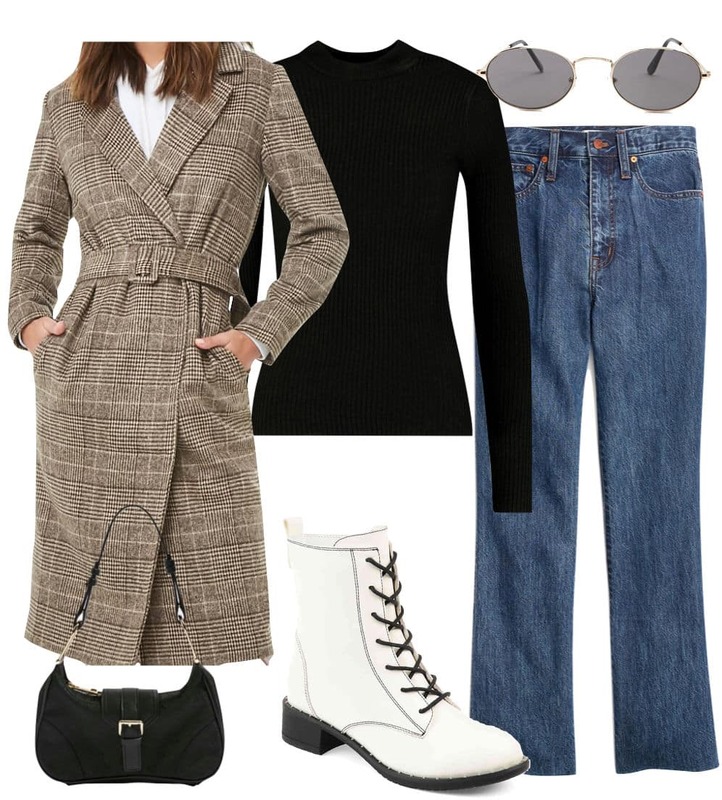 Get Kaia’s ensemble by wearing a beige plaid long coat that has a menswear-inspired feel over a black turtleneck. While skinny jeans would work too, try a pair of high-rise bootcut jeans for her fashion-forward look. Give the outfit an edgy touch with some white lace-up boots similar to Kaia’s. Bring the outfit together with ’90s-inspired accessories like metal oval sunnies and a slim black shoulder bag. Actress Yara Shahidi turned heads in a fun, retro-inspired look featuring a tied-up black turtleneck top. She wore it with some ultra wide-leg jeans with overall straps, platform heels, and drop earrings. Yara’s look doesn’t involve a lot of pieces, but it does involve statement pieces — in addition to the classic, simple black turtleneck. Wear it tied-up into a crop top if you please, or tuck it into some high-rise wide-leg jeans. With flared or wide-leg jean styles, it’s often best to pair them with platform shoes to allow the denim to flow when you walk. These black platform ankle booties fit the bill. A pair of drop earrings complete the Yara-inspired ensemble.